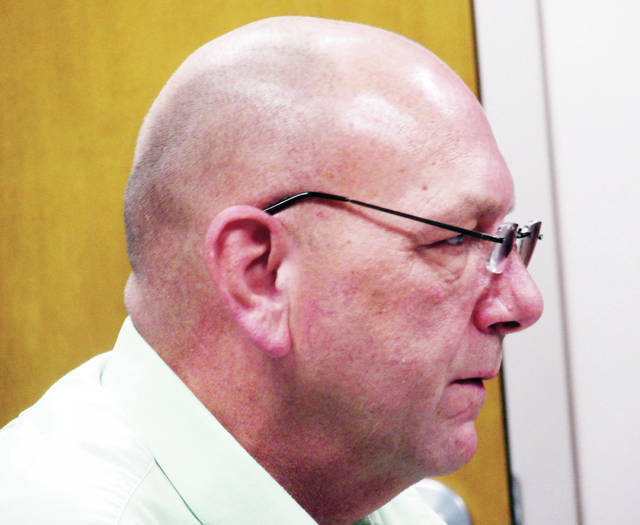 Wauseon Public Service Director Dennis Richardson discussed the biosolids handling project at the Water Reclamation Plant at Monday’s City Council meeting. Wauseon City Council members breezed through a light agenda on Monday, briefly discussing the city’s water reclamation plant and pending information about the new city pool. With no committee reports on the docket, the meeting entered directly into city department reports. Representing Fire Chief Rick Sluder, who was not present, Second Assistant Chief Jeremy Shirkey reminded Council that the annual Christmas For Kids event will be held Saturday. Shirkey said 75 underprivileged children will participate this year, each receiving $100 in gift money. The event begins at 9 a.m., with the children receiving a breakfast sponsored by McDonald’s at the fire station, 230 Clinton St. At 9:45 a.m., they will be transported by a caravan of emergency vehicles to Walmart on Airport Highway for a shopping spree. Police Chief Keith Torbet, whose department also hosts Christmas For Kids, said the goal next year will be to provide for at least 100 children. He invited city residents to attend the shopping portion in support. Mayor Kathy Huner said the experience is heartwarming. “You get to visit with the families. It’s just a really neat experience,” she said. Shirkey also mentioned Breakfast With Santa, to be held Saturday, Dec.15, from 9 a.m. to noon, at the fire station. The pancake breakfast is open to the public and will feature Santa Claus. Donations will be accepted. Torbet told Council members the police department is closing out on its Justice Assistance Grant and Violence Against Women Act Grant. He said the department has received a grant through the Ohio attorney general’s office to purchase body armor vests. Public Service Director Dennis Richardson reported that the nearly year-long biosolids handling project at the city’s Water Reclamation Plant is “now substantially complete” and operational. RG Zachrich Construction Inc. of Defiance was contracted for the work. Richardson said the Public Works Department will finish collecting leaves from residents this week and return to collecting brush. He told the council statistics regarding operation of the city pool this year are pending, and that city crews will begin mobilizing this week for work on a sewer line project on Ottokee Street. Huner added that installation of a second slide has been completed at the city pool. The slide was originally deemed too expensive and removed from original plans. It was later approved when City Council determined it was affordable, but the late decision delayed its construction and installation. Finance Director Jamie Giguere said city income tax revenue was down about four percent in November from the same time last year. She said the city is switching to the Ohio Plan Risk Management insurance program, in part, because the premium is about $21,000 lower than the city’s current plan. • The waiving of three readings and emergency passage of resolutions authorizing the mayor to enter into agreements with Ohio Plan Risk Management Inc. for city insurance coverage and the Fulton County Commissioners for indigent defense services. • The second reading of a resolution authorizing the mayor to enter an agreement for a countywide Emergency Management Agency. • Motions to appoint Councilors Rick Frey and Shane Chamberlin to the Volunteer Fire Fighters Dependents Board, and Frey to the PACE Energy Board for a one-year term. https://www.fcnews.org/wp-content/uploads/sites/45/2018/12/web1_richardson.jpgWauseon Public Service Director Dennis Richardson discussed the biosolids handling project at the Water Reclamation Plant at Monday’s City Council meeting.